Whether you own a marina or a private dock, or you're looking for RV power stations, we have the best selection of versatile electrical power pedestal units to meet the needs of both commercial and residential shore power and RV power applications. Our unique designs are functional and attractive, yet tough enough to endure severe weather conditions from Alaska to the Bahamas. Turnkey electrical layout solutions! We can provide all of the electrical equipment, layout and design, from your docks to your marina development surroundings and beyond! TRUST US to provide you with all of the power pedestals and electrical layout solutions for your dock and marina development surroundings and beyond! Our professional sales and technical staff will assist you and your design team through all aspects of your marina project and selection of appropriate power pedestal and power configurations. Proper planning and layout of the electrical system (like a dockside power pedestal) will minimize equipment and wire costs, as well as reduce installation time and possible construction delays. 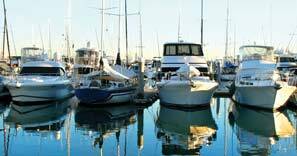 Planning and designing an effective and efficient marina electrical system can be a bit of a challenge. Trust the team at Dock Boxes Unlimited to help you with all aspects of your project from circuit layout to power pedestal and receptacle selection. 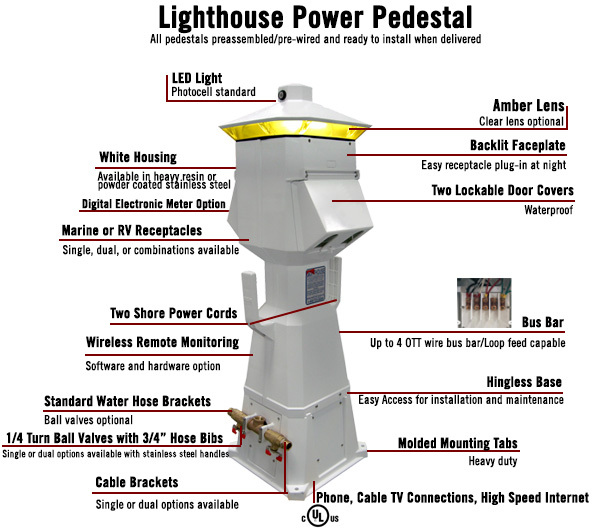 With a large variety of unique styles of power pedestals to choose from, including The Signature Lighthouse, the Hatteras Light, the Newport Harbor Mate or the streamlined Firehouse model, creating an inviting and safe environment is easy. With technical and design assistance from the professionals, get peace of mind in knowing that your power pedestals are placed appropriately and you have all you need to complete your project. Dock Boxes Unlimited - your ultimate source for Marine Power Pedestals.